Over thirty-two percent of Lacosted‘s traffic comes from the Philippines, making it the largest source of traffic for this blog. Almost all of that traffic is either to my post on detecting counterfeit Lacoste shirts or the one on identifying fake women’s bags. Apparently, there is a lot of fake Lacoste out there, which is not surprising when a Lacoste shirt can cost over P4,000. In any event, once I realized how much traffic I was getting from the Philippines, I did some research into why Lacoste is so popular there. Lacoste’s popularity in the Philippines is mainly due to the brand’s long presence (it was introduced in the 1970s), and it’s association with the upper classes. The brand has phenomenal penetration in the Philippines with around ninety-eight percent brand recognition in surveys, and the Philippines is considered the benchmark Asian market for Lacoste. 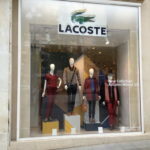 While Lacoste’s customers are mainly more affluent Filipinos, it continues to increase its sales as an aspirational brand for the less affluent. This entry was posted in Lacoste by JFP. Bookmark the permalink.